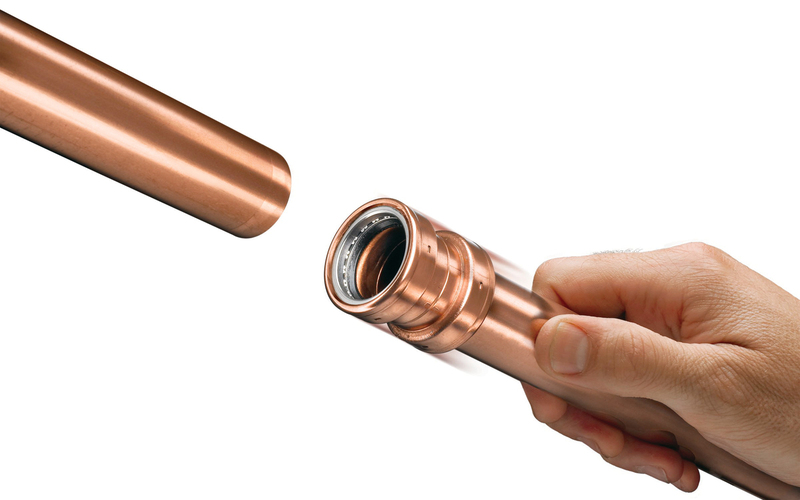 Flame-free copper joining technology like this PermaLynx system from NVent is an exciting new technology for the plumbing industry. Most people don't spend a lot of time thinking about their home's plumbing. After all, it's not very exciting, and benefits like hot showers, clean drinking water on tap and indoor toilets are things we take for granted today. However, it took awhile for bathrooms to progress to current standards. As late as 1940, almost half of the nation's homes still lacked complete indoor plumbing. It's only within living memory that a chain of inventions - from flexible copper tubing to flush toilets to home air-conditioning systems - started America on its road to better hygiene, not to mention more comfortable living conditions. Copper tubing, which helped make indoor plumbing accessible and affordable to all, was a technological advance of greater significance than most people realize. Before it came along, indoor water systems using jointed iron, steel, lead or brass pipe were difficult and expensive to install and maintain, and were found in only the most posh homes. Sometime around 1927 (the exact date is lost in history), metal manufacturers introduced a new type of lightweight yet durable drawn copper tube that could be quickly soldered together with inexpensive copper fittings. This revolutionized plumbing and created the type of indoor water systems virtually every home uses today. In 2003, to commemorate the 75th anniversary of this historic milestone, the Copper Development Association (CDA) launched a nationwide search for the oldest surviving example of authentic indoor copper plumbing. Many candidates were identified and investigated, but a home with copper tubing dating to 1927 has yet to be found. Several early systems examined by CDA experts turned out to have "red brass" piping, a predecessor to copper tubing that contains zinc and can easily be mistaken for true "thinwall" copper systems. However, recently a Fort Wayne, Indiana, residence was discovered with its original copper plumbing system still in good working order. Installed nearly 70 years ago, this home's copper pipes continue to function long after many of its other building materials have been replaced. The search for even older copper tubing systems continues. The advance of copper technology in home applications continues as well. 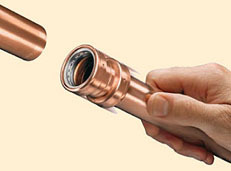 One of the most exciting innovations is a flamefree method of permanently joining copper pipe. This new "Push-to-Connect" system uses specially designed fittings to mechanically connect the tube without the use of expensive, specialized tools. Other copper piping applications today include residential fire sprinklers, snowmelt systems and energy-efficient home solar-heating systems. Another technology that is currently experiencing a resurgence in the home is radiant heating, which uses copper pipe embedded in or under the floor to heat a room.